So having decided that I will be diverting some of my hard-earned cash towards a big holiday with the family next year, what has this done to my savings rate this month? 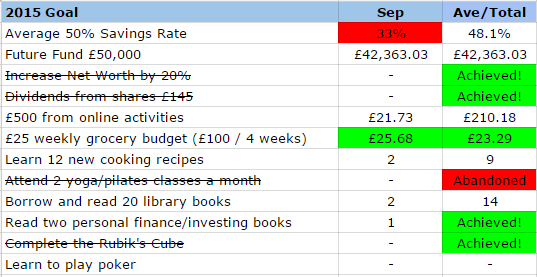 A savings rate of 33%, which is a lot better than I thought I would be able to achieve. Only one rather frugal social outing this month (a good old fashioned pub crawl, no less!) meant that social expenses were kept to a minimum. My average savings rate however, is now down to 48.1%. This month’s savings was topped up with £21.73 from TopCashback* and £50 from rent received. Markets are still all over the place – my strategy is to carry on saving and investing as before. The good news is that there’s been an increase (albeit tiny) this month, even if it is due to money invested this month. My Future Fund now stands at £42,363.03, miles behind on my goal but at least heading in the right direction again. I realised that I may have confused some people when it looked like I’d ‘magically’ cleared my £3k car loan payment out of thin air. I had moved the funds intended to pay off the loan from my Future Fund spreadsheets as I knew I was going to spend the cash, but I should have still included it in my net worth calculation. I’m now going to start including these kinds of funds in my net worth calculation, especially as I need to start building up some sort of emergency fund (or funds, rather). Net Worth is now £109,784.67, an increase of 23% so far from the start of the year. However, this has gone down from last month, as Zoopla’s estimated valuation of my BTL property has dropped. I never thought property prices (in Manchester) could yo-yo that much but I guess I don’t tend to pay much attention really to such price movements normally. I received £4.51 from BP, £8.27 from Rio Tinto, £19.72 from BHP Billiton, £10.95 from Vanguard All World High Div Yield ETF and £3.25 from Bloomsbury Publishing. So a total of £46.70, my second highest monthly dividend income so far! 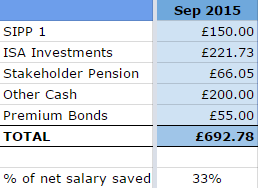 In Sept 2014, I received dividend income totalling £0.19, so you could say I’ve made a bit of a leap in this area, hehe! 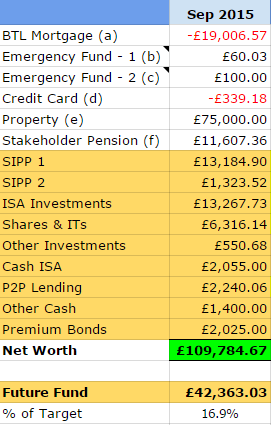 My monthly average is now £25.47, dividends received in 2015 now total £229.27. The only shares I purchased this month were the ones for my Monkey Stocks portfolio. Update coming up in the next day or so on all challengers taking part – watch this space! Food/Groceries Budget – I spent £102.71 this month, averaging £25.68 per week – first time I’ve gone over-budget I think this year! My average weekly spend so far is now £23.29 so I am still within my targeted budget. Cooking Recipes – Corned Beef Hash and Salt & Pepper Ribs – two recipes this month so I am back on track with my goal. Online Earnings – Still lagging on this one but received an amount from TopCashBack as listed above, bringing my total online earnings so far this year to £210.18. Library books – Two books borrowed and read. 14 books borrowed so far, so I’d say I’m still on track to hit my target of 20 library books by the end of the year. Personal finance/investing books – well I finished reading my second one so I have achieved my goal! Will post a mini review shortly. It was good to be able to cross off another goal – I know it was only 2 books but as someone who generally reads fiction for fun, I struggled with them, even though I know reading such books are of more benefit to me than getting lost in made up worlds! This entry was posted in Books, Dividend Investing, Funds, Net Worth, P2P, Portfolio, Savings, Shares by weenie. Bookmark the permalink. Hi M (for some reason, your comment hasn't appeared, on the blog but I received it as an update! Copied below anyway! I am very happy that I was able to save much more than I thought, having paid the initial holiday deposit to my sister this month. Three weekends of staying in and saving money has been quite relaxing too, but as per Huw's recent post, I've suffered from procrastination so should have been more productive! I've made a tiny start to my emergency fund – onwards and upwards haha! M wrote "Way to go Weenie! I think you're doing really well. You're doing pretty well on the 2015 goals, and you're still managing to maintain a high savings rate, even though it's a lot lower than your target – you should be super proud of yourself! Looking forward to seeing what you do about the emergency funds! Hi Weenie, sorry I missed out on what books you were reading? I'm always interested in that, being a bit of a bookworm myself. Good to see you're still tracking against your goals, more than half the battle in my experience. So easy to let them drift off into oblivion – although that might be difficult when they're posted in public! I read predominantly fantasy, science fiction and modern crime/thrillers. What kind of books do you enjoy reading? My goal of reading at least two personal finance/investing books this year is a hard goal as I struggle with non-fiction. These past few years, I've really ramped up my reading so I have an overall goal of reading 40 books, of which 20 this year must be borrowed from the library, to make use of local (and free) services. I probably only borrowed half that amount last year. Congratulations on maintaining a pretty high savings rate (granted not as high as you may like, but compared to the rest of the UK…!) – especially whilst also trying to pay towards the great holiday coming up! Don't knock the fiction! I read far more fiction than non-fiction as well. I know it might be "better" to try and learn something new but sometimes you need to get lost in that fantasy world for a couple of hours. Any reading is good reading as far as I'm concerned so keep it up! 33% is still a pretty good rate, and you can see it is starting to show in your freedom fund. You have now also got the pleasure of comparing this year's dividends to last years, and see meaningful amounts in a month instead of just a few pounds. I am lucky to have been building my FIRE Engine for quite a while so I had the real pleasure of my last post on income being about a month of over £500 received. It is great to see others also progressing towards their ultimate goal. Thanks and it was actually one of your recent posts that got me thinking more about emergency funds so thanks! I certainly don't knock fiction since that's pretty much all I read (hence the challenge I set!) – reading is a relaxing and cheap hobby, great for us frugal peeps! Thanks for your kind words. Yes, it's great to see those dividends increasing – when I first started buying shares, I really underestimated the amount of income that I could get. I shall continue watch and enjoy! Yes, 33% is still a good rate, I guess I've set myself some higher standards though, haha! That's fantastic that you received over £500 dividend income – well done! Ultimately, I have around £200 per month in my mind to aim for – will need to see how it fits in with my investing strategy. Thanks for the kind wishes and for stopping by! Yes, it's ticking along nicely – it'll be funny when the Monkey Stocks add their dividends too, haha! My cooking…it's getting there – going for something simple this month, which I have no idea why I've never done before…you'll see when I post it! It was interesting to see a more detailed breakdown of your finances. Nice one! Haha, I love all the extra notes as well. You find yourself having to pre-empt the questions people might have if you don't and then end up with probably far too many notes in the end that no one reads I find!? Cheers and well done on 33% with your holiday payments as well that is pretty damn fine in my book. At first, I wasn't going to do the notes but then I realised that if people actually did look at my numbers, they may not make a lot of sense on their own! Thanks for the kind words – things are looking a bit tighter this month but I'll see what I can do!